Boxed in by northbound trucks on Interstate 5 in Linn County on Wednesday. 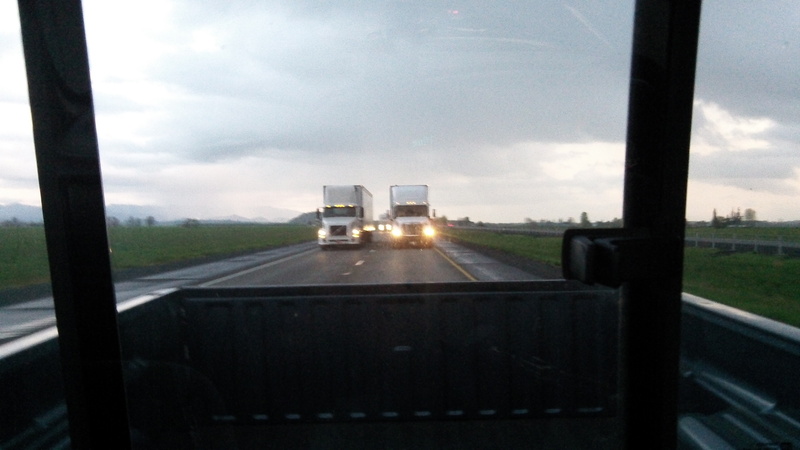 You may have read the stories this week about an increase in truck traffic in Oregon, and how it reflects a comeback in the economy after the slump of the last few years. That sounds like good news — unless you happen to be driving up Interstate 5 when the freeway is clogged with 18-wheelers passing each other at 60 or 61 miles an hour. When your patience is being tested like that, your thoughts turn naturally to our transportation policy, if there is such a thing. You also wonder why all that freight, or at least some of it, does not move by rail. And the answer is that for economic and other reasons, we have let our rail system fall apart on other than the long-distance routes. It’s more efficient for most shippers now to send their stuff by truck. The result is that the long-distance highways are not the only places choking on freight, but our cities are too as over-long semis are forced to negotiate street systems made for much smaller rigs. 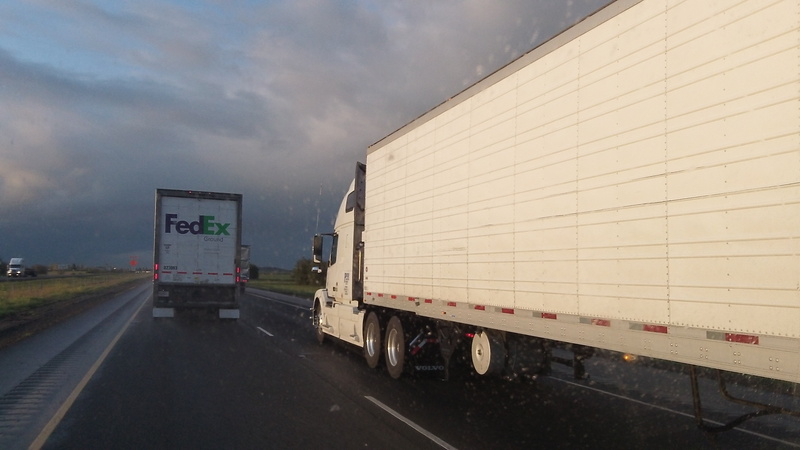 And finally, as you are dawdling along the interstate, you wonder what truck drivers hope to gain when they pull into the left lane to pass another rig that’s moving at about 1 or 2 mph slower than they. Then you finally get where you’re going, and you forget all about it. Unless, of course, you need some material, however meager, for your blog. (hh). My dad spent his career in management at ‘West Coast Grocery’ in Salem, which was later bought out by SuperValu. I recall as a teenager around 1980 or so visiting him at his work. There is a large distribution center in Salem where he worked. There are railroad tracks into the facility which were not used. My dad said that long ago they used the rails for distribution, but were forced to switch to trucks primarily due to reliability reasons. That is they could predict when trucks would leave and arrive and get food delivered to grocery stores when they needed it. This had become impossible to do over rail due to the unreliability of the trains schedules. In the grocery business, one has to ship stock quickly. Perhaps for other non-time critical deliveries (logs, cars, whatnot) the trains are still effective, but not for what was then the new concept of ‘just in time’ inventory management. I do travel by train today, and I enjoy them. I remember reading once that trains are the only method for transporting some very heavy items — such as large military equipment — so I support our rail system, but also understand the issues my dad faced.